At Home Group Inc. HOME opened a new home decor superstore at 3002 Fire Wheel Pkwy. in Garland, TX. This 100,000-square-foot superstore marks the 32nd store in the state and 169th nationwide. Based on a warehouse model, Garland At Home offers more than 50,000 home decor items, with 400 new products updated every week. At Home — one of the fastest-growing retailers — operates approximately 170 stores in 36 states and offers on-trend home products. New store expansion is one of the key strategies for its long-term growth and has been expanding its footprint at a 21% compounded annual growth rate for more than five years. During the second quarter of fiscal 2019, the company opened nine superstores, out of which Elmhurst, Middletown and Manchester are the recent ones. The company has plans to open stores in California and Washington State in the near term. In the last reported quarter, the company’s net sales were up 24.3% year over year, representing the 17th consecutive quarter of more than 20% sales growth. The upsurge was driven by excellent new store productivity and comparable store sales (comps) growth. For the third quarter, the company plans to open within 8-10 new stores. Also, its revenues are anticipated to increase more than 20%, representing the 18th consecutive quarter of comps growth ranging 4.5-5%. Meanwhile, shares of At Home have gained 28.8% against its industry’s decline of 5.8% over a year. Also, earnings estimates for fiscal 2019 and 2020 have been revised upward over the past 60 days, reflecting analysts’ optimism surrounding the company’s growth prospects. Currently, At Home carries a Zacks Rank #5 (Strong Sell). 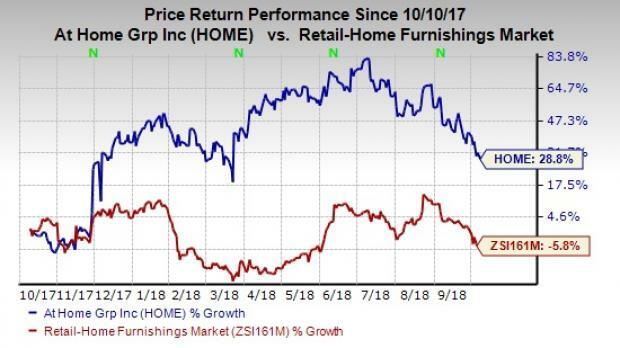 Some better-ranked stocks from the same industry are RH RH, Williams-Sonoma, Inc. WSM and Haverty Furniture Companies, Inc. HVT, each carrying a Zacks Rank #2 (Buy). You can see the complete list of today’s Zacks #1 Rank (Strong Buy) stocks here. RH has an expected earnings growth rate of 149.8% for fiscal 2018. Williams-Sonoma’s expected fiscal 2018 earnings growth rate is 19.9%. Haverty is expected to record an earnings growth rate of 10.4% this year.